Before you do anything, first read this important update. Below you’ll find a list of over 100 vendors (and more in the comments) of vendors that offer commodity community software. Before I joined Forrester as an analyst covering this space, I started this list and it grew and grew. In 2008, I published a vendor product catalog that has details of over 50 of the vendors, beyond these listed descriptions. In Jan 2009 I’ve now published a Forrester Wave which segments the leaders that provide solution (service, strategy, and support) for enterprise class marketers (aka customer communities for the big brands). This doesn’t diminish the other vendors listed, as there are unique use cases for each vendor. I was recently asked by a buddy to name off some social networking platforms that could be branded or changed as needed (that’s where that term ‘white label’ has come from). It’s somewhat relevant as Om Malik has now asked a rhetorical question if Social Network tools are just a feature of website. Overtime, like blogs, these will ‘normalize’. What is “White Label” Software? This is software you can brand and integrate tightly into your existing domain. The user experience should be near seamless, therefore any company can have their own MySpace. Kindly do not submit Social Networking tools that don’t meet this criteria, as the list can extend to hundreds if not thousands of companies. Microsoft’s collaboration suite is getting social networking tools for it’s 2007 version, I’m waiting for Microsoft to call me to do a demo. Pluck already has some other products this could be interesting. This seems to have quite a few educational clients, interesting. Social networking and collaboration suite. Doesn’t appear to be a white label, but it’s certainly a Social Network, pretty interesting. Looks like it has some of the open source apps I’ve used before glued together for a social network. I wonder if this will be a dedicated feature available to most web hosts. Your own Sub-domain. With our social network site, you simply add a sub-domain (an A record) to your website, and this can be whatever your choose… http://members.yourdomain.com, http://community.yourdomain.com, etc.. or even your own dedicated domain name – your choice. “DiSo (dee • zoh) is an umbrella project for a group of open source implementations of these distributed social networking concepts. or as Chris puts it: “to build a social network with its skin inside out”. Go nuts! Here’s many more, some are already on this list. relenet offers highly customizable social network software. It enables our clients and partners to operate professional social network communities on-demand under their own brand. GroupSwim’s award-winning, on-demand products build web 2.0 customer communities and team collaboration sites. Join the thousands of GroupSwim customers helping their businesses collaborate and connect with their customers and employees today. I’ve realized that there are too many players in the space, (my list started with about 8, and grew and grew) in the end (like the CMS industry of the first web wave) only 5 or so will matter. The ones that I’ll recommend to clients (I consult the Fortune 1000) will platforms that will have an open architecture, so it can extend and connect to other social networks. Having both hosted and downloaded options are key, white label rebranding opportunities, and non-proprietary code are essential. No one wants to have multiple IDs, so anything that can provide a solution for long term makes sense. A system that can scale as well as be open to connect to other systems will be key. Thanks for all the wonderful emails regarding this post. For anyone who’s asked for a recommendation, unfortunately, I’m not able to provide one. There’s a few reasons why I don’t recommend any of the above 1) I clearly don’t have the knowledge to review and experiment with all of them (about 40 listed now) 2) I would feel horrible if the project went wrong, and it was due to a product that I recommended. Thanks for understanding, I hope this list is a good start for you for you research. If you do have feedback, I hope you blog it, and then leave a comment below so others can hear about your experience. Update March 5th, 2007: The list continues to grow from email and comment submissions. There’s a few White Label Social Networking apps that are stealth although are apparently doing very well that are NOT even on this list. This market is very large, I wonder how long the demand will support it. Have you read my posts: Social Networking White Label Market Overcrowded, Reminiscent of CMS and Portal craze of Yesteryear and Listened to this podcast A VC’s thoughts on Social Networks? We’ve hit the 40 mark now by adding Dave U networks. This is still one of the top viewed posts according to analytics. I’m at the community unconference here in Mountain View, and I just added Lithium. Over the last few weeks I’ve been adding more and more. There are over 50 players in the space. I also added Six Apart’s Movable type, this is a very, very crowded market. Techcrunch reviewed 9 of the companies here, and linked to this list, more and more visitors to this post, this is one of the top read posts in the last 30 days. This continues to be the top read post, in fact it’s the top read post for the last 6 months. I continue to add names to this list. Amazing how entrepreneurs continue to build companies based on this very, very crowded list. Also, I’ve become an Analyst focused on this market, which means I’ll be spending more time looking at these companies, something I never had time to do before. This list continues to grow, I’ve counted over 60 vendors on this space. I consistently see the same names appear in client emails of vendors, so I’m already seeing a pattern of deployment. What’s needed is segmentation which will eventually result in a shakeout. I’ve given my thoughts to CIO magazine what that will look like. 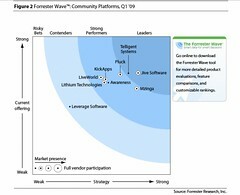 I will be doing a Forrester Wave (a document that ranks and rates the top vendors) in this space sometime mid year. It’s much needed as there’s a lot of confusion in the marketplace. I’ll be rigorous and objective in my analysis, some vendors are going to be very happy, and some will be very angry, but what matters is that I help buyers find the right products. I’ve finally completed and launched the Forrester Wave covering this segment, since then, new vendors like Cisco’s EOS and Social Text have joined the ranks. I’m hoping to see consolidation on this marketplace, it’s overcrowded, clients are confused, and vendors will slash each other down. I’m going to keep a list of mergers and acquisitions in this space. Feb 19, 2008: ONEsite Acquires Social Platform.